On March 4, 1913, Democrat and former New Jersey governor Woodrow Wilson was sworn in as our 28th President from the East Portico of the Capitol Building wearing a frock coat, a rose-colored tie (the rose, flower of Venus), and a silk top hat, and the same Bible that he used in NJ was opened once again to *Psalms 119:43-46. "There has been a change of government. It began two years ago when the House of Representatives became Democratic by a decisive majority. It has now been completed. The Senate about to assemble will also be Democratic. The offices of President and Vice President have been put in the hands of Democrats. What does the change mean? That is the question I am going to try to answer, in order, if I may, to interpret the occasion." He goes on with references to "old things" that "have dropped their disguises and shown themselves alien and sinister" which continues to apply to America's political actors, many of whom now wear hats of both parties but especially those who don't believe in government. Notably in Wilson's natal horoscope his very close Venus-Mars conjunction degree of '18AQ' has "A Man Unmasked" as its Sabian Symbol. Read the full text of Wilson's Inaugural Address of 1913, if you please. Woodrow Wilson born December 29, 1856 12:45 am LMT Staunton, VA Rodden Rating: B, from bio/autobiography; see his horoscope and details here--Sun 7Cap47, Moon 00AQ45, ASC 15Lib31 conjunct his Pre-Natal Eclipse @16Lib52. Hour of Saturn (in 12th house of Politics, Secret Deals, and Karma); ASC 00Can17, a World Point and our US Inaugural ASC until the change to January 20th under FDR in 1937; '1Can' = "A Sailor Ready to Hoist a New Flag to Replace an Old One" which is appropriate for his Inaugural Address and for America's traditional 'transfer of power'; chart-ruler Moon makes only one applying major aspect, a conjunction with excitable Mars in 8th house...war on the way. Plus, the trio forms a midpoint picture: Mars-Uranus (war; explosions; protests) = Moon (the public; women--there was a Women's Suffragette Parade down Pennsylvania Avenue the day before the 1913 Inauguration) and this gives the day an ambitious quality along with a desire for big achievements and 'special efforts expended by women' (Suffragette Parade for The Vote). Even the WhiteHouse.gov site credits Mr. Wilson who, "-asserted international leadership in building a new world order", and though his League of Nations failed, the world is now saddled in its stead with the United Nations which issued from the bowels of the Franklin Roosevelt administration. 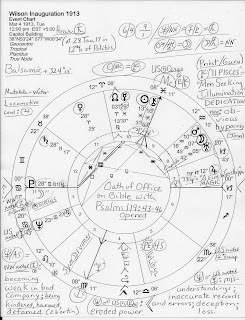 Wilson's first natal planet to rise in the 1913 Inauguration chart is his Saturn Rx (authority, soberness, etc) @11Can00 which probably influenced him in deciding to cancel his own Inaugural Ball in 1913 as being "inappropriate for the occasion". Plus, Saturn brings change, too, which is reflected in his Address, as noted above. 'Twas a mystical time in America when Woodrow Wilson took up his Oval Office role as transit Neptune conjoined US natal Mercury in Cancer (see Neptune conjunct 2nd cusp, the house of our National Treasury: financial deception) and supplied misunderstandings, deception, inaccurate record-keeping, errors, and loss. Neptune also went on to oppose US natal Pluto Rx in late Capricorn and eroded power in ways too numerous to mention in this post. 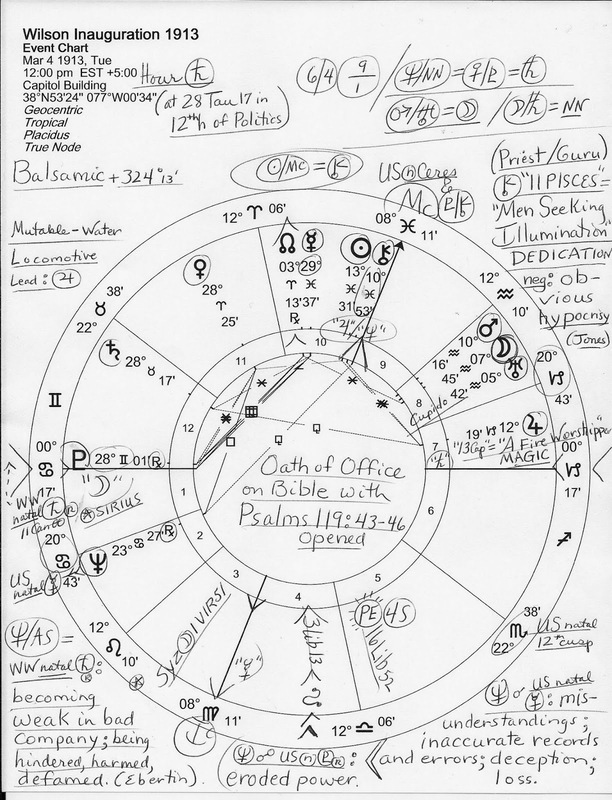 Another chart factor of background influence is Inauguration 1913's Pre-Natal Solar Eclipse Series, the 4 South (in 5th h @16Lib52 conjunct Wilson's natal Ascendant) with its themes of strong emotions over relationships and/or finances, frustration, and with a sense of fatedness attached; take no rash action (Brady.) 4S last manifested in 2002 and you know how Bush-Cheney handled this impulsive yet frustrating energy--by invading Iraq. Like Wilson who ran on 'peace' and 'making the world safe for democracy' and who secretly pledged the US into WWI at the behest of international bankers, they falsely used the "democracy" ruse, too. And it seems to me that all Americans should be more than fed up with such deceptive propaganda by now. *Psalms 119:43--46 KJV: And take not the word of truth utterly out of my mouth; for I have hoped in Thy judgments. So shall I keep Thy law continually for ever and ever. And I will walk at liberty; for I seek Thy precepts. And I will speak of Thy testimonies also before kings, and will not be ashamed.